On the contrary, instead of 6 plus hours of "freedom" while they would be in school, they are mine, all mine, All. day. long. Every. single. day! Yes, I choose that lifestyle. But because of that lifestyle I choose, I also have had to find some different ways to survive my days. Like many single parents, working parents, military moms, widows and more, there are days that survival mode kicks in! Embrace the crock pot! There are just those days when if I did not have something in the crock pot in the morning, we would not eat. Ok, we would probably eat, but not well. And not actually in our house. Dumping in ingredients and having a meal in 8 hours can be a life saver. Embrace rest time! Theirs and yours! No matter the ages. I am a FIRM believer in quiet times in the afternoon. Ours looks different each year, but at the very least there is an hour where everyone goes their separate ways quietly and does not bother one another. Particularly mom! Embrace simple meals. Dinner might get a bit fancier occasionally, but breakfast and lunch are most definitely not. After creating our breakfast chart, I will never go backwards and am seriously contemplating a lunch one as well. Until then, lunches are soups, sandwiches and a lot of leftovers. Embrace help when you need it! Whether you need help with the house cleaning, or a babysitter once a week, or a tutor for a specific subject (or two), get help if you need to. Running yourself into the ground does not help out your family in any way! Embrace adult time! Whether it is an occasional lunch out with a friend or a weekly date with your spouse, take time to be with other adults. The little people in our lives are precious, but they cannot fill our hearts and minds in quite the same way as an adult. Embrace God and prayer! 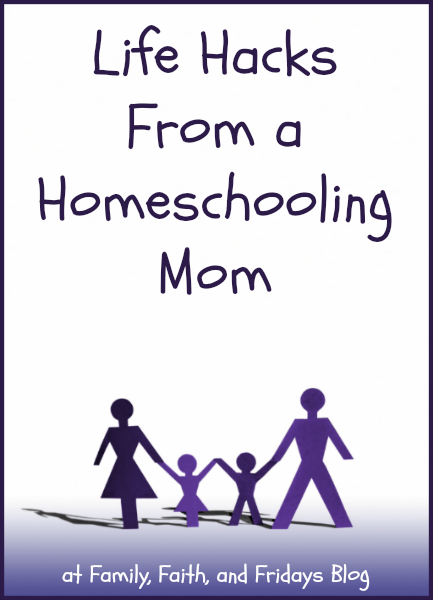 I tease people all the time that we began homeschooling because I knew I could never get my kids to school on time outside our home. But in seriousness, I know that the Lord led us to our decision, and has been with us each step of the way, When I trust Him and allow Him to guide our day, things go remarkable better. Go figure! Another great day of Homeschooling Tips from a great bunch of bloggers! I know you will be blessed, inspired and encouraged by these today. Stop by and tell them I said hi! If you have things in your bag of tools that helps your day to be successful, we would love for you to share them with us! We love hearing from you! I love this! If I didn't start my day with prayer and Bible study, I couldn't make it through breakfast! A good reminder to prioritize our day! Thank you, Megan! Great list Michelle. Want to get back to focusing on my little students more than I have lately.